Introduction: Cone beam computed tomography (CBCT) is a noninvasive method which has gained broad acceptance in dentistry in 10 years. CBCT has been designed as an improvement of the diagnostic tools available for dental applications. It aids in the diagnosis of variations of root canal morphology, endodontic and nonendodontic pathosis, assessing vertical root fractures, analysis of root resorption defects, and presurgical assessment of apicoectomy procedures. Methods: CBCT images of 400 mandibular second premolars, 400 first molars, and 400 second molars were collected from 200 patient's (bilaterally) using their CBCT images. The images were acquired retrospectively and studied for anatomy of root canals and their number. 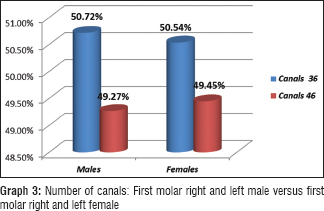 Results: In the present study type IV (89.7%) and type I (77.8%) canal configurations were the most commonly seen in the mesial and distal roots of first and second molars. They were seen in both males and females. Bilateral symmetry was noted in most of the mandibular second premolars for the males and females. They did not show any significant variations in their roots and root canal morphology; however, rare variations were noted in some cases. Conclusion: Present study indicated that we are able to provide more accurate diagnosis and treatment planning with this imaging modality, thereby limiting out any sort of missed canals and overlapping of anatomical structures. Periapical radiographs provide excellent images for most dental radiographic needs. Their primary use is to correlate the clinical examination by providing insight into the internal structure of teeth and supporting bone to reveal caries, alveolar bone loss associated with periodontal disease, periapical conditions, and a wide range of other dental conditions. Most of the time roots and root canals get missed during routine X-rays. The limitation of a radiograph is that it is a two-dimensional representation of a three-dimensional object. Root canal morphology of a tooth evolves as the tooth develops. In general, roots of young teeth have single large canals. With age, deposition of secondary dentine results in the formation of partitions, which often cause extensive differentiation of the root canal system resulting in development of separate canals and transverse connecting systems. The differentiation of a simple root canal into a complex form occurs most commonly in roots which are compressed or which have external grooves. The anatomic root is covered by cementum and extends from the cement-enamel junction (CEJ) to the apex. A root canal starts as a funnel-shaped canal orifice within the pulp chamber, generally below the center of the cusp tips, and ends in an anatomical foramen, which opens onto the root surface between 0 to 3 mm from the center of the root apex. A branch of the main pulp canal or chamber, referred to as an accessory canal, communicates with the external surface of the root. A lateral canal, generally extending horizontally from the main root canal, is placed in the coronal, or middle third, of the root. The morphology of root canal systems varies greatly in different races and also among the different individuals within the same race, thus it is important to be aware of variations in tooth anatomy and its features in various racial groups because this knowledge can help clinician to locate and manage canals during root canal treatment. Various methods have been identified to study canal morphology including tooth sectioning, radiographs, post-treatment clinical observation, and direct observation with microscope, tooth clearing, 3D reconstruction, and computed tomography (CT). Cone beam computed tomography (CBCT), also known as dental volumetric tomography, is a non-invasive method which has gained broad acceptance in dentistry in 10 years. It is capable of providing sub-millimeter resolution images of high diagnostic quality, with short scanning time (10–70 s) and radiation dosages reportedly up to 15 times lower than those of conventional CT scans. 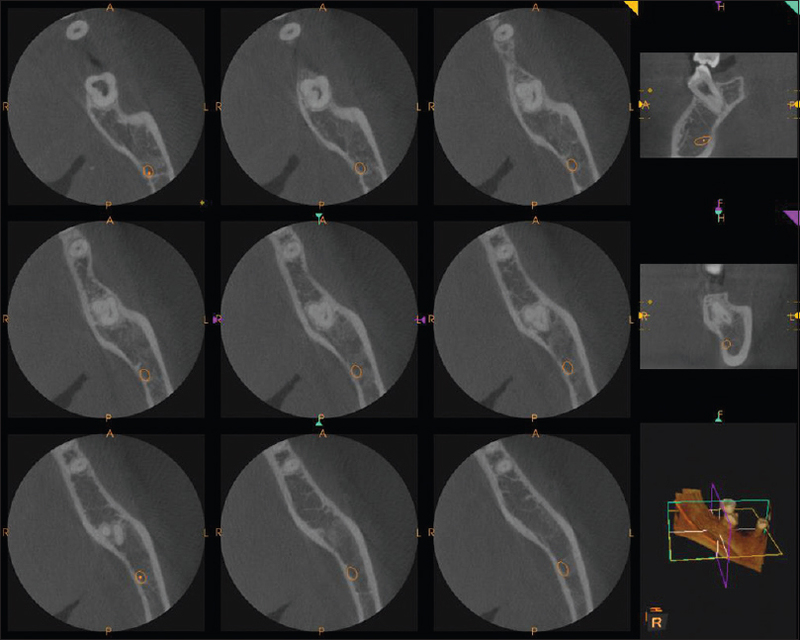 When CBCT is compared with conventional CT, it provides improved accuracy, higher resolution, and lower scans time and radiation doses with thin sliced images. The most common indications for cone beam imaging in dentistry are evaluation of proximity of the lower wisdom teeth to the mandibular nerve before extraction, assessment of teeth for root fracture or periapical diseases, assessment of jaws for placement of dental implants, examination of teeth and facial structures for orthodontic treatment planning, evaluation of temporomandibular joints (TMJs) for osseous degenerative changes, and evaluation of bone for signs of infections, cysts, or tumors. All these applications and many others benefit from viewing of thin slices through the region of interest without superimposition. CBCT was introduced in the field of endodontics in 1990 by Tachibana and Matsumoto. Additionally, CBCT technology aids in the diagnosis of endodontic and non-endodontic pathosis, assessing vertical root fractures, analysis of root resorption defects, and presurgical assessment of apicoectomy procedures. Therefore, the present study was undertaken to assess the variation in number and morphology of the root canals of permanent mandibular second premolars, first, and second molars using CBCT. The objective of this study was to evaluate the root canal morphology of mandibular second premolars, first, and second molars bilaterally in the sub-Indian population. To assess whether there is similarity between the root canal morphology bilaterally. 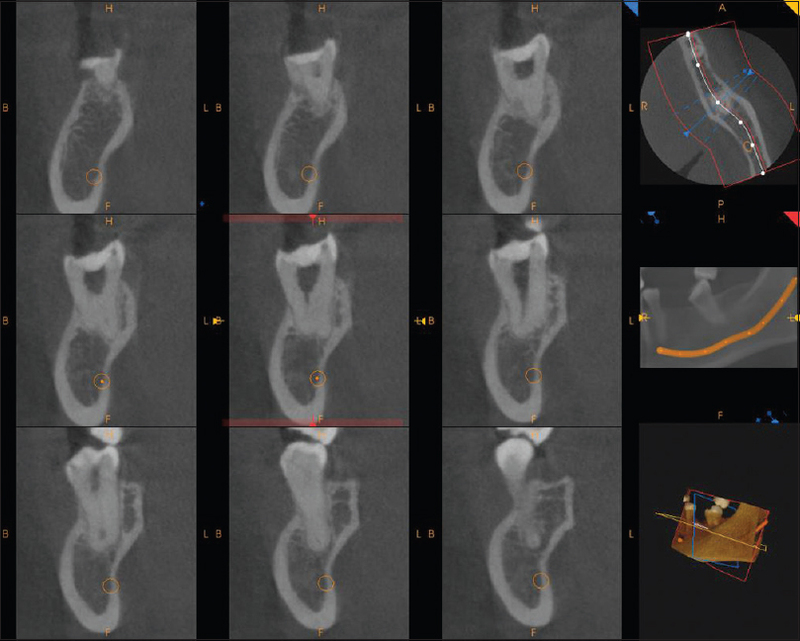 A randomized sample of healthy adults, who have been advised CBCT for variety of clinical indications such as implant planning, trauma, assessment of impacted teeth, and so on were selected. CBCT images of 400 mandibular second premolars, 400 first molars, and 400 second molars were collected from 200 patient's (bilaterally) using their CBCT images. The images were acquired retrospectively and studied for anatomy of root canals and their number. The inclusion criteria included patients aged >18 years of age, mature teeth with fully mature apices, and complete diagnostic images without any artifacts. The study also comprised of exclusion criteria which were no root canals with open apices, resorption or calcification, no root canal treated teeth, grossly carious, fractured tooth, deciduous tooth, images with distortion or artifacts, and missing second premolars or first or second molars in any of the quadrant. 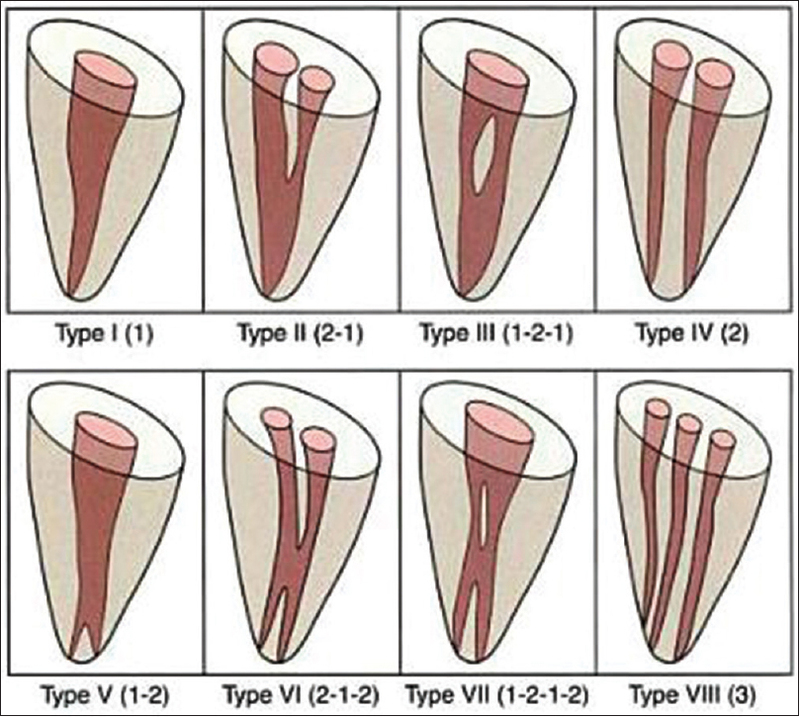 The root canal morphology of mandibular first molars bilaterally according to the Vertucci's classification. TYPE I – Single canal is present in the pulp chamber from crown to apex. TYPE II – Pulp separates in two near the crown and joins at the apex to form one root canal. TYPE III – Starts as one root canal in the pulpal chamber and divided into two as it nears the apical foramen and then fuses again to form a single root near the apical foramen. TYPE IV – The root separates into two distinct canals and extends till the root apex separately. TYPE V – The root canal is single as a single entity extending till the apex of the root by dividing into two separate canals right before the apical foramen. TYPE VI – Root canal start as two canals from pulp chamber and join at the middle of the root to form one and extend till the apex and again divide into two canals just short of apical foramen. TYPE VII – Root canal starts as a single pulp canal till the middle one-third of root and then divides into two separate canals and then rejoins after some distance and then near the apex divides into two canals again just near the apex. TYPE VIII – The pulp chamber near the coronal portion divides into three separate root canals extending till the apex of the root. The statistical software IBM SPSS statistics 20.0 (IBM Corporation, Armonk, NY, USA) was used for the analyses of the data and the Microsoft word and Excel were used to generate graphs, tables, and so on. Descriptive and inferential statistical analyses were carried out in the present study. Results on categorical measurement were presented in number (%). Level of significance was fixed at P = 0.05 and any value ≤0.05 was considered to be statistically significant. Chi-square analysis was used to find the significance of study parameters on categorical scale. The values subjected to Chi-square test were at 0.0023 for which P value was 0.9621, showing these values are not significant, since P value was >0.05. The values subjected to Chi-square value were at 0.0042 for which the P value was 0.9486, showing these values are not significant, since P value was >0.05. The values subjected to Chi-square test were at 0 for which the P value was 1. These values showed that they were not significant, since P value was >0.05. Anatomy and morphology information of root canal system has an important role in endodontic treatments. Missing canals and inappropriate instrumentation are the most common reasons for failures of endodontic treatment. Several studies have reported variations in the number of roots and the location of the canals. These include the presence of third canal in the mesial root, three canals in the distal root, and mandibular first molar with five, six, or even seven canals. C-shaped canal configuration is one of the most essential anatomic variations of the root canal system. It was first postulated by Cooke and Cox. It is named for the C-shaped cross-sectional morphology of the root and root canal. It occurs due to the failure of the Hertwig's epithelial root sheath to fuse to the lingual or buccal side. Numerous classifications were proposed to better understand the C-shaped morphology. The most commonly used was the one proposed by Melton et al. CBCT has a good diagnostic accuracy in level with the digital operating microscope. Moreover, for the patients who require three-dimensional investigations, CBCT with low radiation dose is preferred over traditional CT examination. The advent of CBCT has made it possible to visualize the dentition, the maxillofacial skeleton, and the relationship of anatomic structures in three-dimensions. 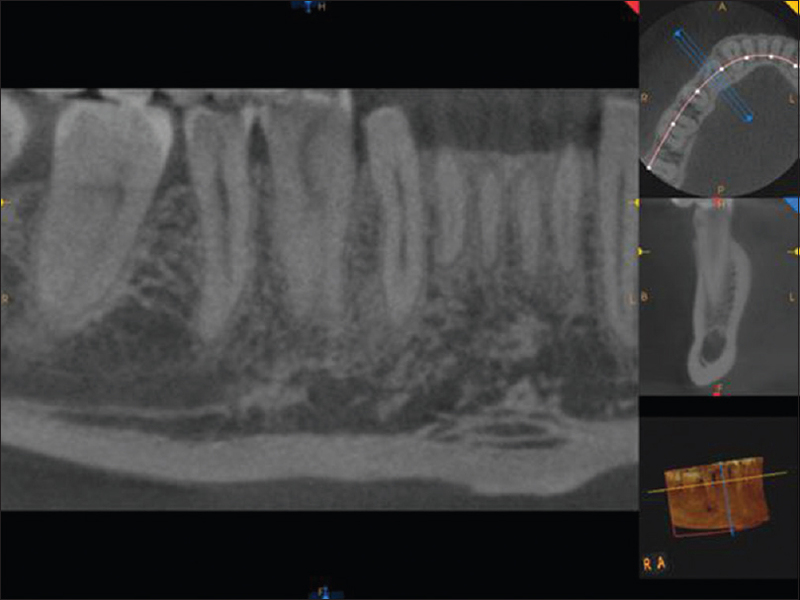 Endodontic applications using CBCT has gained wide acceptance over the past decade. It helps the clinicians by providing three-dimensional information about the external and internal morphology of the root canal systems. In the present study, with the help of the CBCT, evaluation of the mandibular second premolars, first molars, and second molars took place, providing a comprehensive report on the number of roots and root canal morphology of males and females, respectively. In the 400 mandibular second premolars examined, 400 (100%) were found to have single root with single canal. This finding was similar to the study conducted by Felsypremila et al. Studies performed by Alhadainy and Huang et al. only included mandibular first premolars. In the case of mandibular first molars, the majority (100%) had one root located each, mesially and distally. The incidence of two separate roots is similar to that reported in a previous study of Turkish population by Demirbuga et al. ; however, it is higher than that reported in Burmese (58.2%) and Thai populations (54%). 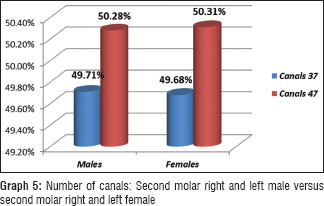 In the present study, the frequencies of two canals (type IV) in the mesial and distal roots of the first molars were 97% (males) and 95% (females), respectively. The findings of this study was similar to those reported in the previous studies of Turkish and western Chinese populations using CBCT. In the present study, type IV configuration was the most prevalent with 89% in females and 92% in males in the mesial roots for the permanent second molars. Studies by Felsypremila et al. and Wang et al. showed the mesial roots having a prevalence of type IV configuration which was similar to the findings of the present study. 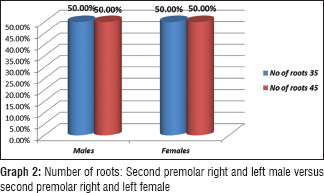 The most common morphology of the distal roots was type I with a frequency between 54% to 72%. Our study showed, type I canal configuration being the most prevalent after type IV canal configuration, accounting for 14.5% in the distal roots. The study furthermore went on to show a high prevalence in type IV and type I. Type IV configuration was found to be the most common root canal configuration in the present study showing 52% followed by 32% of type I and 16% for type II. This finding agrees with those of Demirbuga et al. and Ahmed et al. According to Vertucci et al. and Gulabivala et al. type I was the most common canal configuration noted in the mesial roots. Arslan et al. 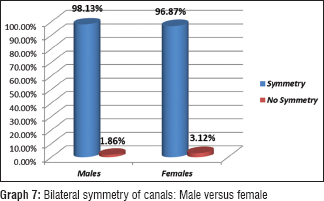 found that in Turkish population the most common canal morphology in the mesial roots was type IV (59.5%), followed by type II (32.8%). The distal roots predominantly showed type I (74.7%), followed by type II (12.3%) and type IV (9.7%) using CBCT. Nur et al. showed similar findings. Zhang et al. in their study on Chinese population using CBCT on permanent mandibular first molar concluded that most mesial roots had more complex canal morphologies, whereas the distal roots had type I configuration. Trope et al. found out that black patients have a higher number of mandibular premolars with extra canals than white patients. 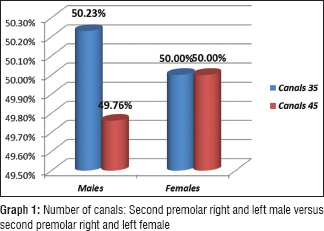 Black patients had more than one canal in 32.8% of first premolars and 7.8% of second premolars. Multiple canals in white patients occur in 13.7% of first premolars and 2.8% of second premolars. Park et al. 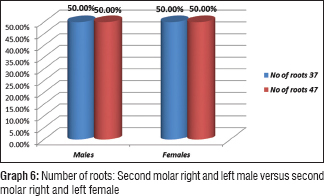 evaluated root anatomy of permanent mandibular premolars and molars which showed that there was high prevalence of three-rooted mandibular first molars and C-shaped roots in mandibular second molars in the Korean population. All these above studies show that the configuration of the root canal system varies with different frequencies in different populations. Several possible reasons may account for these differences, such as ethnicity of the populations, sample size, and the method used to study the morphologies of the canals. Most of the population showed type IV to be the most prevalent configuration which was similar to the findings of our study. This may be because our population included most of the Indians from within India. Mandibular bilateral symmetry was noted for the second premolars, first, and second molars in our study [Graph 7]. Out of the 202 second premolars in males and 198 second premolars in females, 97.53% of them showed bilateral symmetry. This finding was similar to the result of a study conducted by Felsypremila et al. Further analyzing the results of the study, bilateral symmetry was also seen for the mandibular first molars and second molars. Out of the 400 first molars evaluated, 62.53% males and 37.46% females had bilateral symmetry noted in relation to the first molars, whereas out of 804 second molars evaluated 62.68% males and 37.31% females showed bilateral symmetry for the mandibular second molars. Gulabivala et al. studied the root and the root canal morphology of the Burmese population using canal staining and tooth clearing technique. 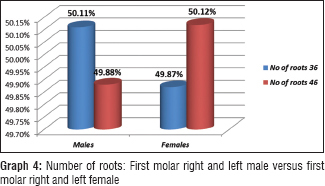 The results showed that most of the mandibular molars had two separate roots (90% in first molars, 58% in second molars, and 53% in third molars) and the three rooted teeth were confined to first molars. Fan et al. investigated the anatomical features of C-shaped morphology system in mandibular second molars using micro-computed tomography. Of the 58 molars that were scanned, 54 of them had a C-shaped canal system. The cross-sectional shape varied drastically along the length of the canal. CBCT is capable of providing accurate, sub-millimeter resolution images in formats allowing 3D visualization of the complexity of the maxillofacial region. All current generations of CBCT systems provide useful diagnostic images. In the present study type IV (89.7%) and type I (77.8%) canal configurations were the most commonly seen in the mesial and distal roots of first and second molars. They were seen in both males and females. Bilateral symmetry was noted in most of the mandibular second premolars for the males and females. They did not show any significant variations in their roots and root canal morphology; however, rare variations were noted in some cases. These variations should be kept in mind by clinicians before attempting any root canal procedure and to take aid of CBCT for visualization of such complex maxillofacial structures. Bilateral asymmetry was noted for the mandibular first and second molars which could be attributed to the variation in the mesiobuccal root. There were no statistical differences seen in the root canal in respect to the type of canal configuration for the mesial and distal canal. The distribution of the configurations of the root canal systems in this population differed from the other Caucasian groups suggesting that variations in root canal systems may be attributed to racial divergence. Present study indicated that we are able to provide more accurate diagnosis and treatment planning with this imaging modality, thereby limiting out any sort of missed canals and overlapping of anatomical structures. Thomas RP, Moule AJ, Bryant R. Root canal morphology of maxillary permanent first molar teeth at various ages. Int Endod J 1993;26:257-67. Vertucci FJ, Haddix JE, Britto LR. Tooth morphology and access cavity preparation. In: Cohen S, Hargreaves KM, editors. Pathways of the Pulp. St. Louis: Mosby; 2006. p. 148-232. Cotton TP, Geisler TM, Holden DT, Schwartz SA, Schindler WG. Endodontic applications of cone-beam volumetric tomography. J Endod 2007;33:1121-32. Tachibana H, Matsumoto K. Applicability of X-ray computerized tomography in endodontics. Endod Dent Traumatol 1990;6:16-20. Vertucci FJ. Root canal anatomy of the human permanent teeth. Oral Surg Oral Med Oral Pathol 1984;58:589-99. Cooke HG 3rd, Cox FL. C-shaped canal configurations in mandibular molars. J Am Dent Assoc 1979;99:836-9. Melton DC, Krell KV, Fuller MW. Anatomical and histological features of C-shaped canals in mandibular second molars. J Endod 1991;17:384-8. Felsypremila G, Vinothkumar TS, Kandaswamy D. Anatomic symmetry of root and root canal morphology of posterior teeth in Indian subpopulation using cone beam computed tomography: A retrospective study. Eur J Dent 2015;9:500-7. Alhadainy HA. Canal configuration of mandibular first premolars in an Egyptian population. J Adv Res 2013;4:123-8. Huang YD, Wu J, Sheu RJ, Chen MH, Chien DL, Huang YT, et al. Evaluation of the root and root canal systems of mandibular first premolars in Northern Taiwanese patients using cone-beam computed tomography. J Formos Med Assoc 2015;114:1129-34. Demirbuga S, Sekerci AE, Dinçer AN, Cayabatmaz M, Zorba YO. Use of cone-beam computed tomography to evaluate root and canal morphology of mandibular first and second molars in Turkish individuals. Med Oral Patol Oral Cir Bucal 2013;18:e737-44. Wang Y, Zheng QH, Zhou XD, Tang L, Wang Q, Zheng GN, et al. Evaluation of the root and canal morphology of mandibular first permanent molars in a Western Chinese population by cone-beam computed tomography. J Endod 2010;36:1786-9. Ahmed HA, Abu-bakr NH, Yahia NA, Ibrahim YE. Root and canal morphology of permanent mandibular molars in a Sudanese population. Int Endod J 2007;40:766-71. Gulabivala K, Aung TH, Alavi A, Ng YL. Root and canal morphology of Burmese mandibular molars. Int Endod J 2001;34:359-70. Arslan OM, Barutcigil C, Cantekin K. Evaluating root and root canal configuration of mandibular first molars with cone beam computed tomography in a Turkish population. J Dent Sci 2013;8:80-6. Nur BG, Ok E, Altunsoy M, Aglarci OS, Colak M, Gungor E, et al. Evaluation of the root and canal morphology of mandibular permanent molars in a South-Eastern Turkish population using cone-beam computed tomography. Eur J Dent 2014;8:154-9. Zhang R, Wang H, Tian YY, Yu X, Hu T, Dummer PM, et al. Use of cone-beam computed tomography to evaluate root and canal morphology of mandibular molars in Chinese individuals. Int Endod J 2011;44:990-9. Trope M, Elfenbein L, Tronstad L. Mandibular premolars with more than one root canal in different race groups. J Endod 1986;12:343-5. Park JB, Kim N, Park S, Kim Y, Ko Y. Evaluation of root anatomy of permanent mandibular premolars and molars in a Korean population with cone-beam computed tomography. Eur J Dent 2013;7:94-101. Fan B, Cheung GS, Fan M, Gutmann JL, Bian Z. C-shaped canal system in mandibular second molars: Part I – Anatomical features. J Endod 2004;30:899-903.